As Catholics, we firmly believe that marriage is a most sacred commitment that deserves the careful attention and preparation on the part of all who are involved: the couple, the clergy and the Church. In order to assist you in this process, we have put together the following guidelines for weddings at St. James the Greater. Please carefully read this. Please ensure that your wedding coordinator and photographer consult these guidelines prior to the wedding rehearsal. If you have any further questions, please do not hesitate to contact a member of the parish clergy at 314-645-0167. The offering for the use of the Church is $500 for registered parishioners and $1000 for non-parishioners, which covers only the use of the Church. A deposit of $500.00 must be made at the time of scheduling the wedding date. The final amount due, if any, is payable no later than one month prior to wedding date. No dates will be reserved until $500.00 deposit is made. If wedding is cancelled, a full refund will be made. Priest or Deacon: The suggested gift for the priest or deacon who witnesses your wedding is $150.00 or more. Altar Servers: The suggested stipend for altar servers for weddings (usually 2) is $10-$20 per server. A valid Missouri civil marriage license is required for all couples that wish to get married at St. James the Greater Catholic Church. It is the couple's responsibility to acquire this license. It is to be presented to the priest/deacon at the time of your Rehearsal. In order to preserve the sacredness and dignity proper to Christian marriage, all wedding ceremonies must conform to the guidelines outlined below. Wedding coordinators and photographers are to be made aware of these guidelines and must agree to abide by them. There is some flexibility allowed for you to personalize your wedding ceremony. However, ceremony plans are not final until they are approved by the priest/deacon with whom you are working. Liturgical Celebration: The marriage of two Catholics is ordinarily celebrated within the context of a Mass. If one of the parties is baptized, but not Catholic, the wedding may be at Mass or it can be during a Scripture Service. If one of the parties is not baptized, then a Scripture Service is the only option. Reception of Holy Communion: It is the Church's policy that only Roman Catholics may receive Holy Communion at Mass. If your wedding will take place during Mass, it is your responsibility to instruct non-Catholics attending of this policy. Duration of Wedding: All weddings are to not exceed 90 minutes from the scheduled starting time; this includes photographs and reception lines. All photographers, parties and guests must vacate Church property no later than 90 minutes after the scheduled starting time of the wedding. Rehearsal: All necessary paperwork and payments are to be completed and submitted prior to the scheduling of the Rehearsal. Failure to do so may result in the suspension (or cancellation) of your wedding. All involved members of the ceremony are to be present. Readers and musicians/vocalists should arrange a separate time for practice. Music: Music: All matters relating to music for your wedding must be arranged through Adam Wright, Director of Music Ministry at least three months prior to your wedding date. His email is awright@stjamesthegreater.org. At that time, decisions about musical selections and appropriate compensation for musicians/vocalists will be made. In regards to musical selection: Adam will assist you in choosing music that is befitting the dignity and sanctity of marriage. Under no circumstances are secular or pre-recorded music to be used. In regards to musicians: all arrangements for visiting musicians/vocalists are to be made with Adam's approval. Payment to musicians/vocalists is to be made no later than the one week before the wedding date. Unity Candle and Flowers to Mary: These are local customs and are not part of the Catholic Rite of Marriage. 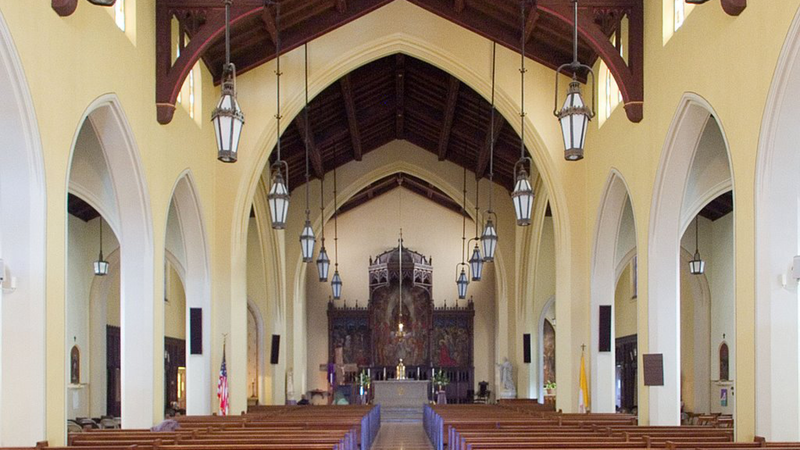 However, we are happy to allow both local customs for weddings here at St. James the Greater. If you wish to use the unity candle in your ceremony, you are to provide the candles and the candle stand. Photography: Photographers are welcome during the wedding ceremony. However, the following stipulations apply: under no circumstances may the photographer(s) enter the sanctuary at any time during the ceremony. Video recording is to be done from a stationary position. Posed photographs are to be taken after the ceremony. All photographers, parties and guests must vacate the Church no later than 90 minutes after the scheduled starting time of the wedding. Decor: You are welcome to add decorations that are appropriate to a church and befitting the dignity of Christian marriage. However, the following stipulations apply: under no circumstances may any Church furnishing and/or seasonal decoration be removed or rearranged without the explicit permission of the priest/deacon. The use of an aisle runner is prohibited. Nothing may be attached to the pews except by ribbon (no tacks, tape, etc.). For insurance reasons: the use of candles in the aisles and the throwing of rice, birdseed, flower petals or any other type of confetti anywhere on Church property are strictly prohibited. Flowers are welcome, although they are to be arranged in a manner that does not block the aisles or "crowd" the altar. Candelabra, if desired, must be supplied by the florist and the candles must not drip wax on the floor. Appropriate Conduct/Dress: The consumption of alcohol on Church property is strictly prohibited at any time before, during and after the wedding. Guests are not to indulge in alcohol prior to arriving on Church property. Any violation of the above may result in the immediate cancellation of your wedding. There is no smoking allowed inside the Church at any time. Thoughtful consideration is to be made in regards to appropriate dress: we suggest "business-casual" for the Rehearsal and "formal" for the Wedding. Apparel selections for all parties involved in the wedding ceremony itself are to be made in respect to the Church. Available Facilities: There are changing facilities available for the bride and bridesmaids in the bride's room located in the back of church. Groom and groomsmen will need to arrive dressed for the occasion. Receiving Line: Due to space limitations as well as time constraints, receiving lines are not allowed at weddings at St. James the Greater.